YOU GET WHAT YOU PAY FOR- boots, flies! Because of the location and the awareness of the shop throughout the world i get to meet many overseas fishermen, guides and local fishermen as they will all stop at the shop. Now i hardly sell any boots and the ones i do sell are Simms, because of the brands name and their services. I personally use their boots and have even many years ago been a product tester for Simms for a new sole for wading boots they were bringing out, which was very interesting for me. Brands like this do the hard yards and testing most of the time they get it right, and the odd time they get it wrong, like every business in the world. Their logo is copied and most of there designs by others and yes - these copies are cheaper - but do they last! Stu's hi-viz mayflies- The time is near!! special new two tone black and white posts. If there is one thing that falls apart before a season finishes it is normally a pair of these cheaper imitation wading boots, so if you buy a pair and they are cheaper and fall apart - please do not complain to the shop you bought them from (i don't sell them just in case your wondering) - just remember what you paid for! Like everything thing in life we all get what we pay for. Just this week alone i had two different fishermen come into the shop to complain about their boots as soles were hanging off and toes were sticking out, they had bought from various outlets in Australia & NZ- again i had to point out - they got what they paid for! CARP In clear water these guys can sometimes be harder than a trophy brown to catch! Flies are the same - you get what you pay for! 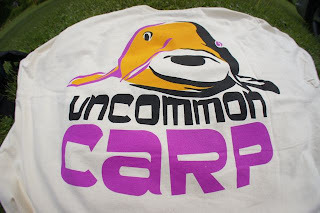 My goal is just like Sage, Simms and other top brands to take my designs using nothing but the best materials and TMC hooks to the world market. I thank you all for your awesome support, photos, feedback and very kind words. Next year i hope to take Stu's Superior flies to your local fishing shop, so please start to inform them that soon they will be able to stock and sell you the best flies and fly designs in the world. I´ve been fishing with other peoples flies throughout the world to get ideas for my own fly designs- with other fly companies - i have found this is a unique process i have worked on- nearly all other companies just copy other patterns and grab a handful of local known fishing guys names and add their name to random flies for promotion(i have been down that path)- no actual hard work has gone into the designs! I caught this fellow on a pink squirrel nymph a fly from Wisconsin - now i have a new idea for a fly!! Support the designer!! direct! The mid and lower Mataura river have just started to clear and sight fishing for trout has become a bit easier in these reaches. There is a few trout at the tail outs of most of the pools and flats rising to the odd Mayfly but these are all about 9inches long or smaller. The great thing is though, is that they can still be hard to catch- size is not everything- skill is! The guides i know in the lower mataura are even struggling to find nymphing fish (which is pretty abnormal for that section) and there has been no hatches or spinner falls, they inform me. Even here at my house i normally know when there is insect life happening as the mayflies and caddis cover my office windows and car in the evening or night. For weeks now there has been nothing on the windows. Now the lower mataura is a great fishery and i hear F&G are making a film about it- good on them- but unless they have skilled cameramen and an production company involved and some money etc involved. The dvd may struggle to compete with other dvd´s - compared to what dvd are coming into the store and the cameras used and quality. But just maybe it will work out, i would think they will gradually do one for each of the countries top river systems north and south! I hope it works out as its a fantastic river and any promotion at the end of the day is great to get more people outside doing it! I´ll keep you informed on the F&G progress. HATCH--- THE NEW DVD from GIN CLEAR - NICK RAYGARET. The other night we had a wee family viewing of a copy of the master dvd that Gin Clear is about to release called - HATCH - This is going to be the first of a series of dvd called hatch, that will follow the hatches/ food sources of fish species throughout the world, their behaviour, fish behaviour and the anglers behaviour when it happens. Poland, England, New Zealand, Australia etc are some of the locations featured. It´s a very slick production and filmed with a red eye movie camera that is used by the big guns in the film industry. Some of the footage of different fish feeding will wet your mouth and you will make vocal noises as fish feed in slow motion (well i did - as some as the shots i thought were awesome) i never saw any god save the queen feeding??? 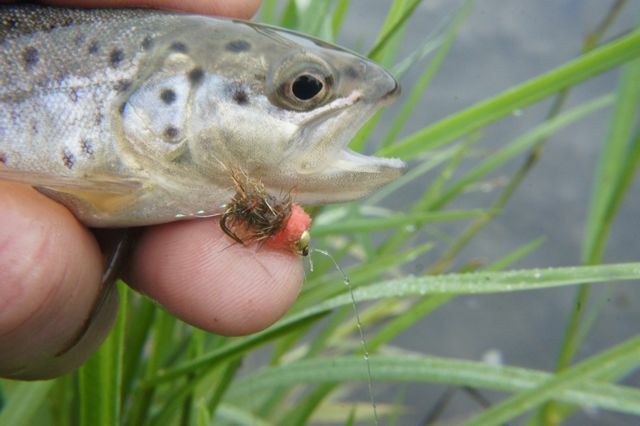 For example you will see footage that has never been filmed before of trout tracking mayfly spinners and taking them. 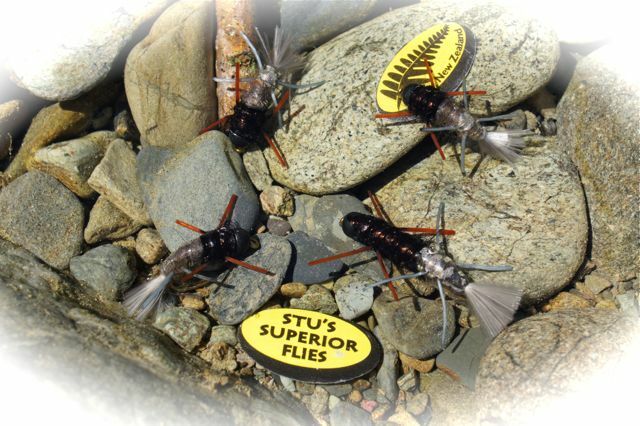 NZ trout eating cicadas! Well we have seen that on other productions. 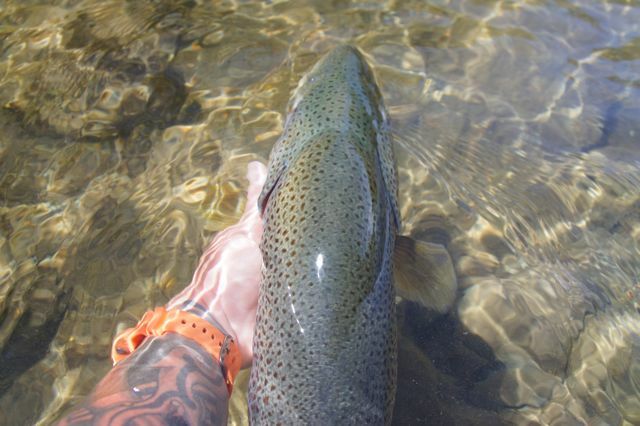 But have you seen a wild trout (not one in a tank) chewing on the cicada to try and swallow it and then loosing it from its mouth and inhaling it again shot underwater in a gin clear NZ river! 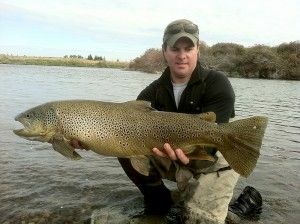 A solid huge NZ trophy brown, i released last week. You will see close up shots of willow grubs, a grub so plentiful but many have never seen! For me this dvd was very educational - probably more so than what Nick ever intended. My parents thought it was a great dvd and thoroughly enjoyed it. I can only think what the next one will include as i know Nick has just bought another $90,000 us dollar state of the art camera for filming the next in the series, not to mention all the other gear. Remember you will get to see it at the RISE fly fishing film festival that is touring NZ and AUS as well as all of Europe. Oh! 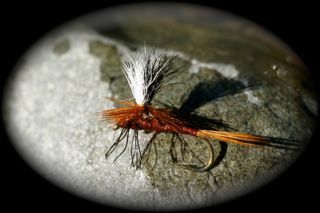 while i remember - it will also be showing in the USA fly fishing film festival, thats is constantly touring the states. 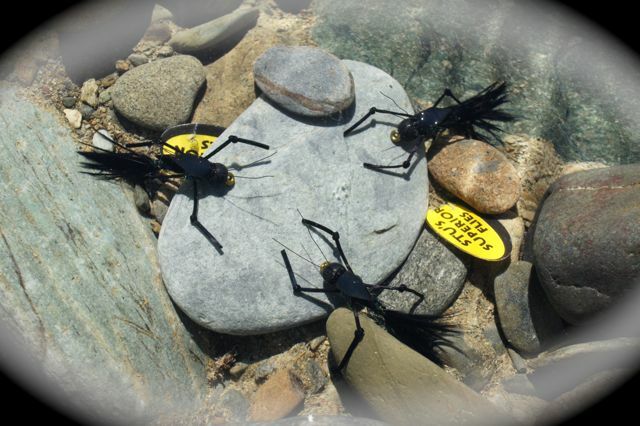 Black Stoneflies at the round table- Very realistic these are under water to show you what the fish see - as they creep along the stones. APRIL GUIDING DATES STILL SOME AVAILABLE! Contact me if you want to catch some beautiful coloured browns, or brush up on your casting and stream craft skills. Hope you all had a great Easter . Remember only weeks left until the shop closes for winter :(- so get your orders in today for your winter fishing. This is Janifer Anderson here. your site if it is okay with you- free of charge of course. Let me know here janifer26@gmail.com,if you interested.